Do Mormons and Christians Really Agree? Thank you so much for writing to me and sharing your experience. Your experience is a common one. Let me be candid with you. Mormons are experts at not getting the point. They don't understand the problem. And these days they are better than ever at apparently agreeing with Christians and explaining their viewpoint in such a way that tricks people into thinking that they are on the same page that Christians are. Brother, let me tell you what the situation is: I am convinced that the Christian Church is very sloppy with the gospel. We are comfortable in our understanding and our explanation of it, but the truth is that we are behind on our ability to explain it clearly and cogently - and we don't even know it! Until an encounter like this arises. This is the beauty of such encounters and why I'm so excited you experienced what you did. P---, you sat down with a couple of guys who do not understand the gospel of Jesus Christ, who are trusting in their own righteousness for their salvation, and you were at a loss to speak with them, and finally resorted to a non-gospel conversation. Brother, I'm not rebuking you strongly, because I know from personal experience myself how difficult this is. Satan has worked overtime to confuse the minds of believers and unbelievers alike. If we are going to tear down his strongholds of false imaginations and arguments and take every thought captive to the obedience of Christ we are going to have to be like precision laser surgeons. This is what a compassionate ministry to Mormons (and all non-believers) requires. We have to scale the new fortifications that he has built; we have to keep up with his newest weapons and arsenal. The fact is it's an arms race and the Mormons are ahead of the Christians. They have been working hard to re-articulate their same false gospel so that it passes for the true gospel, and we Christians are not up to the task of checking it. I can foresee the Christian Church accepting Mormonism as just another denomination which disagrees on the minors but apparently agrees on the majors. But this would be a tragedy both for the Christians and for the Mormons. The truth is, Satan's scheme need to be exposed, and by exposing Mormonism's false gospel Mormons may see the light of the truth and be saved, and Christians will be protected from its leaven. You did the right thing by focusing on the atonement. Excellent. That is a big deal considering many conversations with Mormons don't even get that far. Your problem was only that once you got there you weren't prepared for what they were going to say. I said in my article this was going to take time and practice, so don't be discouraged and don't abandon the more difficult theological approach for the easier apologetic strategy. It is tempting to do so, for not only do the results come faster but the apologetic issues are not unimportant. I acknowledge this. But the quick results are not necessarily good results, and as important as the apologetic issues are there is another and better time for them (of course, this depends on the person: have they heard and understood the gospel or not? Most Mormons have not and therefore need to work through the theological issues before they work through the apologetic ones). You said: "MY claim is that we cannot forsake all our sins, which we all agreed to." Yes, Mormons will agree with that. There are very few Mormons today who would say otherwise. Mormons believe that they cannot be perfect in this life, and therefore they believe they are not expected by God to be perfect in this life. See that? Since they can't be perfect, God doesn't require them to be perfect. Thus, when they are not perfect, they are not failures. Instead of admitting that they fail, they argue that they haven't failed. They are still obedient! No need to worry! 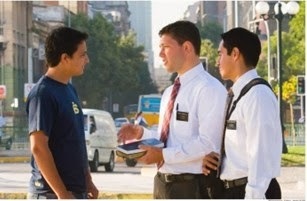 They are still obedience therefore they can still be saved (because salvation depends on one's obedience in Mormonism). However, when Christians confess that they cannot forsake all their sins nor keep all the commandments, they aren't making excuses. They aren't saying it's okay. Christians are admitting failure. Christians are admitting guiltiness. Christians are admitting they are sinners. "Oh wretched man that I am!" (Rom. 7:24) "Woe is me, I am undone!" (Is. 6:5) These are the confessions of a true believer who admits his sin. Mormons are not saying this. God's law explicitly requires perfection. "Love the Lord your God with all your heart, all your soul, all your mind and all your strength." "Be perfect as your heavenly Father is perfect." This is what goodness is and it is beautiful. Mormons won't debate that the commandments require perfection, but they will debate that we must be perfect in this life. God simply doesn't require people to be perfect in this life, they say, because they can't be. 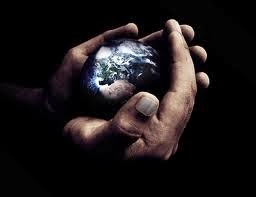 People have all eternity to work on it! The truth is, however, that only the people who are obedient in this life will have all eternity to perfect themselves. Now this is interesting, isn't it? Mormons maintain the idea of obedience and disobedience in this life, but not the standard of perfection. They confess that there are good people and that there are bad people in the here and now, but that the standard at this time isn't perfection. Let's make sure we are absolutely clear: in Mormonism the reception of the atonement requires this non-perfect kind of obedience. So when Mormons say that no one is perfect and therefore we are saved by grace, they are not jettisoning the legalistic idea that forgiveness and salvation are conditioned upon one's works. To be sure, in Mormonism forgiveness and salvation are conditioned upon our works, just not our perfect works. Obedience to commandments is the condition for the blessings of the atonement. But what exactly is this obedience? What exactly is the standard if it is not perfection? How does a person know when they have succeeded or when they have failed? The truth is there is no way to articulate this standard. God's real standard is perfection and that makes cogent sense in the universe, but whenever people try to change the standard of righteousness to anything other than perfection it ceases to make any cogent sense. It is like explaining how a circle is a square. It's impossible because they are by definition exclusive to one another and cannot be equated. To explain how righteousness isn't perfection is the same as explaining how a circle is a square - for righteousness and non-perfection are exclusive to one another and cannot be equated- it is simply impossible to do so. The same applies to obedience. Is there such a thing as non-perfect obedience? Try and explain how a person can be obedient if he isn't perfectly obedient. Can we call a person obedient who doesn't obey what he is told? If the parent tells a child to clean their whole room and the child cleans part of the room, was the child partly obedient? We sometimes think so in a colloquial kind of way, but in reality there answer is no. The child wasn't obedient because what the parent told the child to do was clean the whole room. The child didn't clean the whole room, therefore the child isn't obedient. Obedience means you listened and did what you were told to do. Mormons seek to explain the illusive non-perfect standard in various ways, and by reflecting upon their explanations we are able to see the impossibility of what they're saying. They say: "God doesn't require you to be perfect, He just requires you to do your best." What does it mean to do your best? The best that you could do would be to do what you are able to do. It means for you to perform optimally, to the greatest degree that you are capable of, to put forth the ultimate effort that you could give. One way to respond to this explanation is to ask the Mormon if he has done his best, ie. optimally performed. The answer will of course be no (if, however, for some reason he says that he has, it is usually because he doesn't understand the question. It is common for this to happen. You could rephrase the question and ask, "So, you could not do better?" Most will then understand and say that they could do better, thus admitting that they don't do their best. If the person continues to say that he does his best and that he couldn't do better, you have a stage four spiritual cancer patient on your hands and a healthy dose of 1 John 1:8 is in order). But another way to respond to this explanation is by showing the Mormon that this explanation of the standard is no different than perfection. That is, the Mormon thinks he is lowering the standard but he actually isn't. Consider for a moment that if you do what you are able to do you have therefore done perfectly. God is not unjust to command you to do something that you are physically unable to do, and even the Book of Mormon explains that God never gives you commands that you can't keep (1 Nephi 3:7). Therefore doing your best - that is, doing just what you are able to do - would make you sinless, and sinlessness is perfection. So they haven't actually advanced a new standard away from perfection. Let me illustrate this idea. Suppose a man is commanded by God to lift a 10,000 pound barbell over his head. Of course, no man is physically able to do that. If the man tries his best to lift the barbell and fails, did the man sin? No he hasn't, because he did not willfully disregard the commandment of God. All sin involves the will. A person only sins when his will is involved and he uses his free agency to disobey. Mormons will resonate deeply with this, for they make much of the free agency of man. Suppose, however, that God commands a man to lift a 20 pound barbell over his head. The man is physically able to do that. But what if he refuses to do so? What if he chooses not to, even though he can? That is disobedience. That is sin, because it involves the will. All sin is like that. There is no sin that is not like that, for if God told you to do something that you could not do, yet you wanted to do it, that would not be sin. To put it another way, two things are always needed in order to keep God's commandments. One is ability and the other is willingness. If you have the ability but not the willingness to keep the commandments, you won't keep the commandments. If you have the willingness to keep the commandments but not the ability, you can't keep the commandments. The former case is sin, for you are able but unwilling. The latter case is not sin, for you are willing but unable (like the 10,000 pound barbell example). Explain this to the Mormon and then ask him if he breaks any of God's commandments. If he does, ask him if it is because he is unable or if it is because he is unwilling? If he says it is because he is unwilling then he is a sinner who isn't doing his best. Therefore if the standard is doing his best he has failed. If he says it is because he is unable but not unwilling, then explain to him that he hasn't sinned and this would mean he is perfect. He isn't a sinner, for he doesn't willfully do anything wrong. Thus the standard can be left at perfection and he claims to have passed it! Most Mormons will have a hard time admitting that they are perfect and that they don't break any commandments due to unwillingness. Hopefully you will find honest Mormons who admit their failures. They will be very interested at that point to hear the gospel of grace. Other ways Mormons seek to explain the non-perfect standard is by saying: "God doesn't require us to be perfect, but He does require us to try." We should ask them what exactly constitutes trying? The dictionary defines trying as "an attempt or effort to do something." You can attempt to do something and succeed and you can attempt to do something and fail. This brings us back to our barbell example. The man attempted to pick up the barbell and failed. Did he fail because he was unable or unwilling? Mormons will also say, "God doesn't require us to succeed, He just judges our intentions and desires." But once again the above lesson applies equally to this as well, because if they break God's commandments due to unwillingness, then it is proof that they don't have the desires and intentions to obey. If they are willing but simply unable then they aren't sinners at all! We need to become experts at helping Mormons see this dilemma. We especially need to help them see that their words have meaning, and that the meaning of what they are saying doesn't advance a solution to the problem of perfection. The problem can't be fixed by merely changing definitions. But this is exactly what Mormons are attempting to do. We Christians also need to see that for all the new ways Mormons explain their religion it is still the same false gospel of works. Mormons believe that in order to be forgiven of their sins they must be obedient. They must be in the good person category and not in the bad person category in order for them to qualify for salvation. No amount of re-defining words can change this. The only thing that makes a true difference is when a Mormon realizes that he is a sinner, in the bad person category without excuse, and that he is helpless to do anything about it himself. When Mormons resort to their doctrine of repentance they are actually saying that they can fix the problem. "I messed up, I'll need to fix it." And how do they attempt to fix it? By once again trying to turn from their sin and obey the commandments. This brings us right back to square one. When I talk with Mormons I am unflinching on this question of the standard of righteousness and what constitutes obedience. The reality is that most Mormons have not thought about it at all. They are speaking back to you what they have been taught and they desperately need to reflect on the meaning of their words. Their grasp of the situation is surface deep. We must not let them fool us. When we begin to sharpen our swords and are able to skillfully expose the real dilemma to Mormons (and indeed to all non-believers, for these principles apply to every single religion, not just to Mormonism) we will inevitably discover many people who are openly hostile to the idea that they are actually sinful and that salvation is actually by grace (in meaning, not just in word). We will experience the hatred that Jesus talked about that we so seldom experience because our conversations remain only ankle deep. Cut to the bone and watch the lions roar. But the good news is that we will also find many people who are starving for light and righteousness and who will be amazed by this liberating message of real grace for real sinners. Making people uncomfortable and even angry is a danger we must be willing to take if we are to seek and save that which is lost. Thank you so much, P---, for your courage in witnessing to those guys. It thrilled me to read how you applied those principles from my article. The result was what I expected. It just shows us how much we need to practice sharing the gospel and how much more we need to equip ourselves to combat the ever-improving arsenal of the enemy. David Chilton begins the book by seeking to correct what he sees as a faulty interpretation of the Olivet Discourse (Jesus's eschatological teaching to his disciples). Chilton writes as if he were but pointing out the obvious, yet by writing so he merely points out how little he understands the Olivet Discourse as well as the viewpoint that he so flippantly criticizes. Chilton repeatedly pigeonholes those who don't see things his way as those who don't understand the Old Testament, but it is painfully obvious that the one who in fact fails to understand the Old Testament is Chilton himself, for had he understood it he could never have written a book as ridiculous as this one. Had he understood the Jewish context and mindset of Jesus and his disciples he could never have imagined his incredible idea that the disciples equated the "the end of the age" with the destruction of Jerusalem. This would be the last thing any Jew in the first century would think. According to the Old Testament the coming of the Messiah and the dawning of the new age meant salvation for Jerusalem, the opposite of what Chilton imagines the disciples of Jesus believed. By saying this Chilton reveals how little he understands the Old Testament hope and how little he appreciates what Jerusalem means to God and the Jews. Furthermore, Chilton fails to see the strength of the opposing view regarding the Olivet Discourse. He fails to see that there are better ways of understanding Jesus' words that are more reasonable than the far-fetched and outlandish interpretations that he sets forth. Chilton is left straining and bending the texts to fit them within the historical setting of the 1st century. His explanations are simplistic and not well thought through. A comparison of his view side by side with the opposing view would be instructive, but the reader must not expect to find such a comparison presented in this book. In essence Chilton has flippantly disregarded the main message of the Old Testament regarding Israel, carelessly handled the clear teachings of the Lord Jesus and his apostles in the New Testament, and staked the weight of his argument upon a wholesale reinterpretation of the Book of Revelation. It is unwise to put all of your weight upon an apocalyptic book like Revelation, the symbolism of which has baffled commentators for millennia. A far wiser policy would be to interpret the less clear passages in the Bible by the clear passages in the Bible, rather than the other way around as Chilton does. But it is precisely in the clear passages of the Bible that Chilton stumbles, and he must take refuge in the apocalyptic. 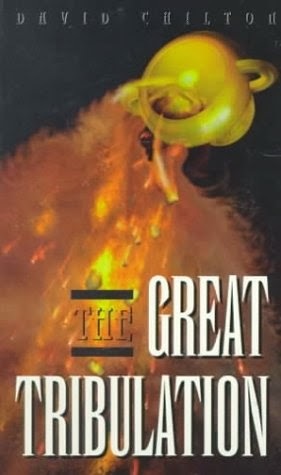 Nonetheless Chilton's interpretation of Revelation is as strained as his interpretation of the Olivet Discourse, as he attempts to make every jot and tittle of John's apocalypse a vitriolic imprecation against the nation of Israel. There are two things that can be said about Preterists like Chilton: 1) they don't believe Israel is significant anymore, and 2) they still hate them. Remarkably, Chilton argues that the early Christians prayed ardently for the destruction of Jerusalem and the nation of Israel. They got on their knees and begged God for this because only when Israel was gone would "the new age of the Church" and "the New World Order" begin, when the Church can finally assert its authority and dominate the world. This is in direct opposition to the prayer and longing of Paul the apostle for Israel in Romans 9:1-3, 10:1 and 11:1-36. This is also fanciful thinking which is evidently false, for the Church did not need to wait for the destruction of Israel to be the missionary Church that she is called to be by the Lord, nor has the destruction of Israel in 70 AD seen any marked change in the world for the Church. As the years have rolled on Chilton's imagined triumph has been shown to be but a dream. And what of the establishment of Israel again in 1948? Did the sovereign God - whom Chilton rightly declares is in control of every motion in heaven and on earth - make a mistake by reversing the once and for all supposed declaration in Israel's destruction of the "the age of the New Covenant"? Such views are at odds, not only with Scripture, but with plain common sense. The tone of this book is shockingly hateful. It reminds one of Jesus' statement to the sons of thunder who wanted to call down fire and brimstone upon those cities that rejected Christ: "You know not what manner of spirit you are of." (Luke 9:55) Chilton believes the Church has the power and responsibility, through liturgy and prayer, to cause God to destroy evildoers and evil nations. He urges passionately that the Church should be doing just that: praying imprecatory prayers for the destruction of the ungodly. The liturgical power he attributes to the Christian Church in order to curse and destroy reminds me of the Hindu spells Brahminical priests claim to have possession of and use to dispose of undesirables. According to Chilton, I wonder if the Church should be spreading the gospel of God's grace to sinners at all, or just praying for their destruction. The world might become a better place faster if we stopped trying to persuade unbelievers and just annihilated them (through prayer of course, for the glory of God). The message and tone of this book is just ugly. David Chilton did the Body of Christ and the world a disservice by writing this book and his others that are like it. Perhaps the one redeeming thing that comes out of books like these is that it helps us sharpen our understanding and grasp more deeply what the true is in contrast to the false. False teaching has an interesting way of doing that. John Bright's writing style is interesting and animated, which makes this book an easy page turner. Most of the book is an excellent analysis of Israel's history and the progress of Israel's understanding of the kingdom of God. I found this very helpful and well thought through. For this alone it is well worth the read. However, the book disappoints in the last few chapters when Bright begins discussing the kingdom of God in New Testament. It is not that I don't agree with him in his conclusion that the kingdom of God is "already" and "not yet": his discussion of the tension between the kingdom already come and the kingdom still coming is undoubtedly excellent. But it is that Bright wholly sidesteps the issue of the land of Israel, not even mentioning it, as if it was a non-issue. This is remarkable because the entire Old Testament is building up this theme, only for Bright it falls flat in the New Testament. This is a colossal oversight (or better, error) made by many Christian scholars. We fail to see the significance of the land of Israel, as well as the kingly motif of the son of David, even though the land and the coming king are writ large all over the Scriptures! In the latter part of the book Bright also repeatedly uses the non-Biblical and almost blasphemous (though certainly unintentional) phrase "new Israel", even though the Bible never once uses this phrase and never conceives the Church of Christ as the "new Israel". In fact Bright contradicts himself, for in the course of the book he explains how the Church saw itself as the righteous remnant within Israel (a point well made). Here was an unfortunate and sloppy oversight. 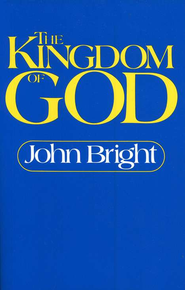 The problems with Bright's book are similar to the problems with Graeme Goldsworthy's book "Gospel and Kingdom", written on the same subject. Both authors do a masterful job of analyzing the Old Testament and tracing the concept of the kingdom of God in Israel's thinking. Their books are pure gold on this point. But then when they both get to the New Testament everything changes and they absolutely fail to connect the dynamic theme, which they had so wonderfully been following in the Old Testament, with the New Testament. Everything falls flat; concepts are redefined; and we are left with an entirely different conception in the New Testament than what we were getting so excited about in the Old Testament. In my opinion this is due to a sloppy Christian systematic way of thinking that gets forced upon the New Testament. This way of thinking doesn't know how to connect with Israel's historical hope. The result is a very Gentilish and non-Biblical idea of the kingdom which is foreign to the Biblical authors themselves. What amazes me most of all is how Christian scholars can make this jarring maneuver without hardly noticing nor even making mention of the land of Israel and the son of David, those enormous Old Testament themes they discard. Nonetheless the book is full of priceless gems and insights and is greatly worth reading. I simply hope to help future readings of this book (and other books on the same subject) to notice the glaring omissions made by many Christian scholars, and to take special care in seeing the continuity between both Testaments. The lack that exists in Christian scholarship on this point needs serious remedy. This is a beautiful and powerful passage in John Calvin's Institutes of the Christian Religion, in which brother John paints a sobering picture of the world if God wasn't in control versus the world in which He is. To Calvin, the fact that God was in control of all things wasn't a cold, hard doctrine that one needed to swallow painfully, but a wonderful, comforting truth to be embraced and enjoyed by reverent (pious) minds. This is, most of all, a doctrine of incalculable pastoral value. "Here we are forcibly reminded of the inestimable felicity of a pious mind. Innumerable are the ills which beset human life, and present death in as many different forms. Not to go beyond ourselves, since the body is a receptacle, nay the nurse, of a thousand diseases, a man cannot move without carrying along with him many forms of destruction. His life is in a manner interwoven with death. For what else can be said where heat and cold bring equal danger? Then, in what direction soever you turn, all surrounding objects not only may do harm, but almost openly threaten and seem to present immediate death. Go on board a ship, you are but a plank’s breadth from death. Mount a horse, the stumbling of a foot endangers your life. Walk along the streets, every tile upon the roofs is a source of danger. If a sharp instrument is in your own hand, or that of a friend, the possible harm is manifest. All the savage beasts you see are so many beings armed for your destruction. Even within a high walled garden, where everything ministers to delight, a serpent will sometimes lurk. Your house, constantly exposed to fire, threatens you with poverty by day, with destruction by night. Your fields, subject to hail, mildew, drought, and other injuries, denounce barrenness, and thereby famine. I say nothing of poison, treachery, robbery, some of which beset us at home, others follow us abroad. Amid these perils, must not man be very miserable, as one who, more dead than alive, with difficulty draws an anxious and feeble breath, just as if a drawn sword were constantly suspended over his neck? It may be said that these things happen seldom, at least not always, or to all, certainly never all at once. I admit it; but since we are reminded by the example of others, that they may also happen to us, and that our life is not an exception any more than theirs, it is impossible not to fear and dread as if they were to befall us. What can you imagine more grievous than such trepidation? Add that there is something like an insult to God when it is said, that man, the noblest of the creatures, stands exposed to every blind and random stroke of fortune. Here, however, we were only referring to the misery which man should feel, were he placed under the dominion of chance. But when once the light of Divine Providence has illumined the believer’s soul, he is relieved and set free, not only from the extreme fear and anxiety which formerly oppressed him, but from all care. For as he justly shudders at the idea of chance, so he can confidently commit himself to God. This, I say, is his comfort, that his heavenly Father so embraces all things under his power—so governs them at will by his nod—so regulates them by his wisdom, that nothing takes place save according to his appointment; that received into his favour, and entrusted to the care of his angels neither fire, nor water, nor sword, can do him harm, except in so far as God their master is pleased to permit. For thus sings the Psalm, “Surely he shall deliver thee from the snare of the fowler, and from the noisome pestilence. He shall cover thee with his feathers, and under his wings shalt thou trust; his truth shall be thy shield and buckler. Thou shalt not be afraid for the terror by night; nor for the arrow that flieth by day; nor for the pestilence that walketh in darkness; nor for the destruction that wasteth at noonday” &c. (Ps. 91:2-6). Hence the exulting confidence of the saints, “The Lord is on my side; I will not fear: what can man do unto me? The Lord taketh my part with them that help me.” “Though an host should encamp against me, my heart shall not fear.” “Yea, though I walk through the valley of the shadow of death, I will fear no evil.” (Ps. 118:6; 27:3; 23:4)."